Flying Blind, LLC accepts all major credit cards, PayPal transactions, and Bank Certified Checks. Please note that all list prices do not include shipping and handling. All products are available only while supplies last, so hurry! 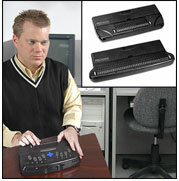 One PAC Mate 40 Cell Portable Braille Display for US$1,995.00! This rarely used, simplistic, yet robust low-cost Braille alternative connects seamlessly to a desktop or laptop PC and offers a great deal of versatility and flexibility for the individual who desires portability and ease of use. One PowerBraille 65 for US$995.00! We are selling this longstanding Braille Terminal which has been historically chosen as the federal Braille display of choice by many Federal agencies for a fraction of its original list price! One PacMate Omni for US$1,595.00! This speech-only, portable alternative to the Windows Mobile operating system combines instant on/off access with an easy to use QWERTY keyboard and speech output providing the user limitless possibilities using today's mainstream portable applications prevalent on both college campuses and within employment settings. One Pac Mate QX400 (Classic Model) for US$895.00! We are pleased to offer the World's first accessible Windows Mobile device designed for persons who are blind at a price close to that of an accessible, off-the-shelf PDA. This speech-only solution touts all of the functionality of the classic Windows Mobile platform while offering many of the same JAWS For Windows commands via its QWERTY keyboard that users are already familiar with executing when using a PC, thus lessening the overall learning curve.